Hello all the geeks out there!! 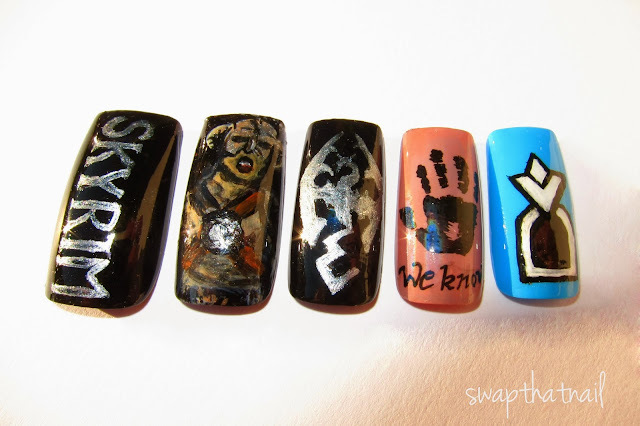 I made these nails inspired by one of my favorite game: The Elder Scrolls V Skyrim. Those who haven't played it yet or don't know about it, I would like to give some explanation. In this game, you can choose your character, customize them according to your wish. It is an action-role playing game. I went for Wood Elf. You get some extra skills and powers. I got to command animals and resist disease & poison by 50 %. On my nails, I made a Skyrim logo and a Dragon born on second. :) The middle finger nail have dragon symbol which is on game cover and hand print with "we know" written at the bottom, is a message from Brotherhood, as an invitation to join them. And on pinky nail, I had made a door symbol when quest is activated. I am very happy with the result and with the game too ;-) Thank you so much for having a look. What do you think? You can buy them too, here.